Ghost Houses, also known as Haunted Houses or Boo Houses, are large buildings where Boos and other ghosts live. They first appeared in Super Mario World, and have appeared in later Mario platformer games such as New Super Mario Bros. and New Super Mario Bros. Wii. Unlike most other Mario franchise levels, Ghost Houses are primarily puzzle-based, requiring the player to find the correct path in order to progress. The Ghost House of Chocolate Island. The entrance of a Ghost House, seen in Super Mario World: Super Mario Advance 2. Ghost Houses first appeared in Super Mario World, where there were six Ghost Houses in Dinosaur Land: two in Donut Plains (one secret), one inside the Vanilla Dome, one in the Forest of Illusion, one on Chocolate Island, and one in the Valley of Bowser. As with Castles, Yoshi will stay outside of the Ghost House when Mario or Luigi enters. The given reason is Yoshi's fear of ghosts, but the technical reason is because the doors inside Ghost Houses (and castles) can't be entered while riding Yoshi, and some enemies located inside do not work properly with Yoshi. Whenever Mario completes one, the game can be saved, regardless of whether the stage has already been beaten. As Mario can replay the ghost house stages at any time, this is an easy way to save the game whenever the user wishes. Several Ghost Houses appear in New Super Mario Bros.; these introduced more new ghost species such as Phantom Hands, Broozers, and Balloon Boos. The game also introduces the Ghost House quirk of having Boos cover up the bottom screen while Mario or Luigi is inside Ghost Houses. There are four in the game, located in World 3, World 4, World 5 and World 7. All Ghost Houses in the game have secret exits, but no checkpoints. The Ghost Houses from the previous game re-appear in New Super Mario Bros. Wii, this time with Boos flying around them on the world map, just like in Super Mario World. They are located only in World 3, World 4, World 5, World 7 and the Coin Battle World. Some Ghost Houses introduce new enemies like Scaredy Rats and Obake Stands and most of them have many fake walls. As in the previous game, all Ghost Houses have secret exits, but no checkpoints. A Ghost House in World 4 in Super Mario 3D Land. In Super Mario 3D Land, Ghost Houses function in much the same way as in the previous games. They are found in World 4, World 6, World 8, Special 4, Special 5 and Special 6 of the game. There are new enemies, including Tail Boos and Peepas. Ghost Houses reappear in New Super Mario Bros. 2 for the Nintendo 3DS containing Boos, Peepas, and the colossal Boohemoth. There are 7 Ghost Houses in the game, one in each world, excluding World 1 and World Star. Once again, there are no checkpoints, and like in New Super Mario Bros., Boos once again cover up the bottom screen when Mario or Luigi is in a Ghost House. There are four Ghost Houses in New Super Mario Bros. U: one in Sparkling Waters (similar to the Sunken Ghost Ship from Super Mario World), another in Frosted Glacier, yet another in Soda Jungle, and still another in Meringue Clouds. Soda Jungle's haunted section features haunted courses like Painted Swampland. There is also a Ghost House-related Challenge Mode course, The Haunted Propeller. Once again, in all the Ghost Houses, there are secret exits and no checkpoints. As it is with the rest of New Super Luigi U, different Ghost Houses appear in the same locations as in New Super Mario Bros. U: one in Sparkling Waters, another in Frosted Glacier, yet another in Soda Jungle, and still another in Meringue Clouds. Once again, Soda Jungle features haunted levels. Ghost Houses also appear in Super Mario 3D World. These ghost houses are not really puzzling, meaning they are like other courses, excluding the Ghost house in World Flower. A new power-up called a Light Box can be used to defeat ghosts. Ghost houses appear in World 3, World 6, World Bowser, World Star, World Mushroom and World Flower. A Ghost House course theme appears in Super Mario Maker, Super Mario Maker for Nintendo 3DS, and Super Mario Maker 2, available for all four game styles. Super Mario Maker marks the first time Ghost Houses appear in the Super Mario Bros. and Super Mario Bros. 3 styles. 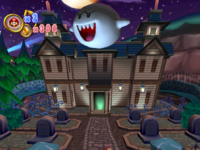 The mansion of Big Boo's Haunt of Super Mario 64 is a Ghost House. Sirena Beach's Hotel Delfino is similar to a Ghost House in many ways. Ghostly Galaxy from Super Mario Galaxy contains a ghost mansion which Luigi is kept in. Boo Mushrooms appear as well. In Super Mario Galaxy 2, two Ghost Houses exist. The first, Haunty Halls Galaxy, features a ghost house that is invisible and intangible unless Yoshi eats a Bulb Berry. The second, Boo Moon Galaxy, features a pop-up book with a ghost house, as well as a graveyard, and a ghost tower where Mario becomes Boo Mario. A Ghost House also appears as a K'Nex building set for Super Mario 3D Land. Boo's Mansion in Paper Mario and Creepy Steeple in Paper Mario: The Thousand-Year Door are Ghost House locations. In Super Paper Mario, Merlee's Mansion is like a ghost house for most rooms (e.g. not the bathrooms). The Enigmansion, found in Paper Mario: Sticker Star, acts like a Ghost House until the Boos are removed, of which it becomes a peaceful mansion. However, the Scaredy Rats remain. The haunted manor level in Paper Mario: Color Splash is called Dark Bloo Inn. In Mario Party 4, Boo Houses appear as a type of shop. There is one Boo House on each board, typically in a fairly difficult-to-access location. They are managed by the board's host in tandem with a single Boo (in Boo's Haunted Bash, the Boo House is managed by two Boos), and enable a player who visits to use the Boo's Crystal Ball, allowing the player to pay 5 Coins to steal Coins from another player, or 50 Coins to steal a Star from another player. The Boo House acts as a replacement for Boo's function as a solitary character in the previous Mario Party games, who would steal Coins and Stars at the same rates. Additionally, the boards King Boo's Haunted Hideaway from Mario Party 8 and Boo's Horror Castle from Mario Party 9 take place inside Ghost Houses, inhabited by Boos, Scaredy Rats, and other creatures. Minigames that feature or take place in buildings that resemble Ghost Houses are Locked Out, Eye Sore, Candlelight Flight, Light Up My Night, Ghost in the Hall, Boo-ting Gallery, Specter Inspector, Manor of Escape, King Boo's Puzzle Attack, Boo-Bye, Boo Tag, and Peek-a-Boo. Luigi's Mansion, the main location of the game of the same name, is a Ghost House. In addition, its sequel Luigi's Mansion: Dark Moon is set across multiple mansions. There is a "Haunted House" in The Fun Fair, the hub area of Mario Pinball Land, where both regular Boo enemies and a Big Boo boss can be encountered. In Dance Dance Revolution: Mario Mix, a Ghost House is found in Wario's Carnival. Though this so-called "Ghost House" is a haunted house attraction, it actually contains Boos. In Super Mario 3D Land, a ghost can be seen at the end of any Ghost House course. This can be seen if the player stands on the platform near the rightmost edge for 30 seconds. The ghost will slowly appear, and then will open its mouth before it eventually fades away. The same ghost can be seen at 8-4, at the beginning of the level in the right-lower corner of the first window, making the same effect. The music that plays in the Ghost Valley courses in Super Mario Kart is a sped-up remix of the music that plays in the Ghost Houses in Super Mario World. The music that plays in the Ghost Houses in Super Mario World also was remixed as the background music for Haunty Halls Galaxy and Boo Moon Galaxy in Super Mario Galaxy 2, and a portion of the music was arranged into the music for The Enigmansion in Paper Mario: Sticker Star. The music that plays in the Ghost Houses in Super Mario 3D Land is reused from Super Mario Galaxy where it plays in the Ghostly Galaxy. The melody was also arranged for when the Boos appear in the dining room in The Enigmansion in Paper Mario: Sticker Star. ↑ Super Mario World English instruction booklet, page 19. ↑ Stratton, Steve (November 18, 2012). New Super Mario Bros. U: Prima Official Game Guide, page 10. This page was last edited on March 26, 2019, at 00:14.